International Parking Institute Awards of Excellence winners reflect friendlier, more sustainable approaches to parking; winners hail from Las Vegas; Lexington, Ky.; Oklahoma City; Philadelphia; Sacramento, Calif.; Toronto; and Washington, D.C.
(LAS VEGAS – July 1, 2015) – Giant penguins guide drivers to their parking spots at the Philadelphia Zoo; the ruins of a miller’s cottage celebrate a riverfront’s heritage; and Art Deco details in a multi-level garage complement the arts district it serves. These and other award-winning parking facilities and programs all incorporate sustainable elements and exemplify parking as an asset to communities, not an afterthought. “The seven winners of the International Parking Institute 2015 Awards of Excellence may vary significantly in use and appearance, but they collectively symbolize a new way of thinking about parking,” says Shawn Conrad, CAE, executive director of IPI, the world’s largest parking association. Winners were selected by an independent panel of judges representing architectural firms, parking corporations, and city, airport, and university officials. They were recognized at the IPI Conference & Expo in Las Vegas July 1. Complementing the architectural character of its environs, the new 10-story Oklahoma City Arts District Garage serves transient and monthly users with easy access to cultural amenities and local businesses. It blends 837 parking spaces with 20,000 square feet of office and retail in a pedestrian setting. The garage’s Art Deco details such as vertical ornamental metal grilles and glass panels, reflect the architecture of two neighboring historic municipal buildings and the Civic Center Music Hall. The panels’ brightly colored laminated glass, which pays homage to an iconic art glass sculpture by Dale Chihuly in the atrium of the nearby Museum of Art, visually guides users to various parking levels. Structurally, the garage features long-span, cast-in-place, post-tensioned concrete with a minimum number of joints and non-exposed metals. LED lighting provides brightness and energy efficiency and creates a safe, welcoming environment for users while exterior lighting highlights the unique character of the concrete, metal fabric, granite, and glass. The top level will supply parking for a planned three-story residential building above the garage, further enhancing its important role in sustaining downtown business growth. The Philadelphia Zoo’s stunning new intermodal transportation center serves more than 1 million annual visitors with 683 parking spaces, a connecting plaza, and a colorful, animal-themed mural that faces Amtrak rail tracks. Designed to accommodate future growth and redevelopment of the surrounding neighborhood, the $24 million project serves as a catalyst for revitalization while improving pedestrian safety. Features include two-way, 90-degree parking; online, box-office, and gate payment options; a creative, animal-themed wayfinding system; a convenient pedestrian ramp; stair-tower glazing that keeps birds from flying into the glass; and numerous provisions to help the structure endure severe snow, rain, and road-salt runoff. A planned passenger train stop will revive a service that ceased at America’s oldest zoo in the 1940s. American River College Parking Structure, Los Rios Community College District; Sacramento, Calif.
American River College’s $25.9 million, 1,724-space parking garage cleverly conceals its purpose while providing a safe route of travel for thousands of pedestrians via a path and bridge and a grand stair that has become a campus icon. The four-bay structure features accessible, mostly 90-degree parking on all five levels and interior park-on ramps. Large, fabric panels display artwork of college athletic stars and tie it visually to the adjacent athletic center. Two public plazas provide natural and vibrant gathering places, and grading and landscaping guide pedestrians to parking and other destinations, including 12 nearby tennis courts. Low-maintenance decks are sloped for drainage and drought-tolerant plants while security features include glass-backed elevators, sensor-triggered fluorescent lighting, and an interior free of shear walls. Nearly 50,000 square feet of photovoltaic panels are planned for the top level. Originally opened in 1997 as a 262-space surface parking lot, the Toronto Parking Authority’s (TPA) publicly acclaimed new Carpark #414, or Jolly Miller Park, combines 129 spaces with an environmentally rehabilitated public park. Named after an iconic tavern, it features a miller’s cottage to commemorate the grist-mill heritage along the West Don River. In keeping with the look of a ruin, the cottage is built with locally sourced stone and reclaimed lumber, and parking garage surfaces employ local natural flagstone and high-albedo pavers. Modern features of the $706,000 facility include online credit card and cash payment systems, high-efficiency safety lighting, and electrical panels for future electric-vehicle (EV) charging. The visually striking green space incorporates many other sustainable features, including a bioswale to manage stormwater runoff and tree planting to reduce the urban heat-island effect. Plagued by recession and nearly sold off in a 2010 auction, the City of Las Vegas’ Parking Services Division is now a symbol of innovative operation, entrepreneurial spirit, and can-do philosophy. Employees who worked in several departments are unified under the Economic and Urban Development Department, whose oversight includes existing parking assets, development of new assets, third-party contracts, private-development consulting and negotiation, and special-event coordination. 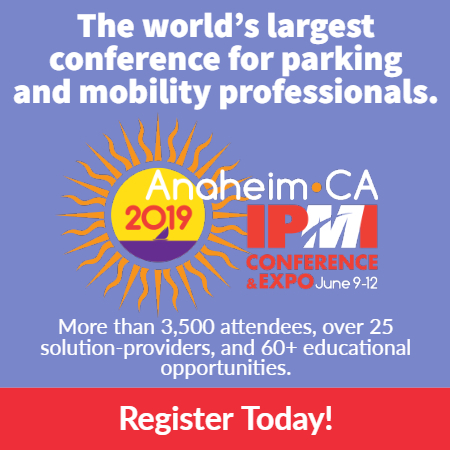 Inadequate special-event parking has been alleviated by converting streets into parking lots, reversing traffic flow to speed up load-in and load-out rates, and directing traffic. New programs have replaced city meters, created online RV parking permits after years of controversy and complaints, and facilitated food truck vending through advance scheduling and real-time space occupancy using parking-meter data and a custom mobile app. Integrated software controls meters, parking and revenue control systems (PARCS), citation issuance, license-plate recognition, billing, collections, DMV interfaces with three states, and accounting. The division also maintains a comprehensive database of parking facilities and data on all downtown spaces and lots’ owners, uses, rates, public availability, and contact information, all of which is available on a GIS map for developers, real estate brokers, and the public. Helix-on-Main Parking Structure, Lexington Parking Authority; Lexington, Ky. The question of whether to demolish or repair the badly deteriorating, 40-year-old Helix Parking Structure, located between two government buildings in Lexington, Ky., ultimately led to a $4 million renovation project that incorporated significant structural and waterproofing repairs, lighting upgrades, signage enhancement, exterior revitalization, and numerous other sustainability features. Drivers easily navigate to spaces via a PARCS (Parking Access Revenue Control System) that offers real-time space-availability information on LED counters outside garage entrances and what used to be a single-exit “choke point” was resolved by the creation of three cashier-free lanes. New signs and graphics significantly enhance the user experience. Outside, waterproofing coatings, a stainless-steel panel system, and programmable LED lights transformed the historic garage into a dynamic element of the downtown fabric. Energy-efficient fluorescent lighting with daylight and motion sensors improve visibility and yield a 50 percent energy savings. ADA spaces were incorporated into a new layout, which is safer and more user-friendly. Operational upgrades have included 24/7 operations, resulting in a revenue increase and more reliable customer service. Award for New Sustainable Parking and Transportation Facilities Excellence: Parking Garage Enhanced/Sustainable LED Lighting, Washington Metropolitan Area Transit Authority; Washington, D.C.
To meet its 2025 targets of reducing energy by 15 percent per vehicle mile and greenhouse gas emissions by 50 percent per vehicle mile, the Washington Metropolitan Area Transit Authority (WMATA) undertook a comprehensive 2014 initiative. Philips Lighting North America replaced 13,000 WMATA-owned and maintained high-pressure sodium light fixtures in 24 parking garages with brighter, energy-efficient, lower-cost, LED options triggered by motion and ambient light. The lighting change also has improved the performance of security cameras. The more than $20 million in lighting equipment and technology, plus a ten-year maintenance contract, was funded entirely through guaranteed energy savings of 68 percent (equivalent to $1.5 million per year at current energy pricing), thanks to an innovative procurement strategy to fund sustainable projects from project-generated savings. The project has reduced energy use annually by some 15 million KWh and carbon emissions equivalent to 140 tanker trucks of gasoline. The lighting has enhanced the overall customer experience while increasing regional mobility and transit ridership. Future projects that will further drive cost savings through sustainability are planned.